ECS provides evaluations, at no cost to families, to determine eligibility and the need for services. Families and professionals work together as a team to plan appropriate services based on the unique strengths and needs of the child and family. 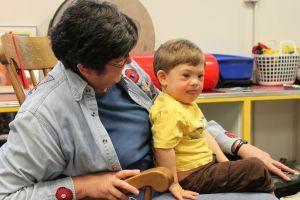 Services are provided in the home and in community settings such as child care facilities, Head Start, play groups, and in inclusive classrooms operated by ECS. Don't wait, if you think your child is delayed in developing, contact us and talk to our friendly office staff who will walk you through the process. The earlier a child is referred, the sooner you can receive the extra help and support that may make a difference. Research tells us that , "Early is Best". We respect that as a parent your concerns are important, and we listen. Parents are included in the screenings, evaluations and meetings to determine how best to meet your family's unique needs. From the child's view, screenings look like play with an evaluator experienced in helping your child and family feel comfortable. Parents call 541-956-2059 say, "I want to refer my child"
How do I know whether my child might need help? Is my child meeting Developmental Milestones?